When we consider the threats we face on the road, a number of dangers leap to mind: distracted or impaired drivers, inclement weather, and speeding. But while these perils are deserving of concern, another hazard is menacing drivers across the nation – and too often going ignored. In fact, thousands of fatal crashes every year result from a culprit few suspect: lack of sleep. According to the CDC, 1 in 25 drivers have fallen asleep while driving in the past month. This stunning trend has tragic consequences, resulting in up to 6,000 fatal crashes annually. In this project, we set out to study the prevalence of deadly accidents stemming from sleep deprivation and the circumstances in which they occur. To do so, we analyzed data from the NHTSA’s Fatality Analysis Reporting System, a nationwide census of fatal crashes and their causes. Our findings present where and when these crashes happen most often, so you can understand and avoid the conditions of greatest risk. To find out where you should be most wary of drowsy driving threats, read on. No state experienced more deadly consequences of driver fatigue than Texas. 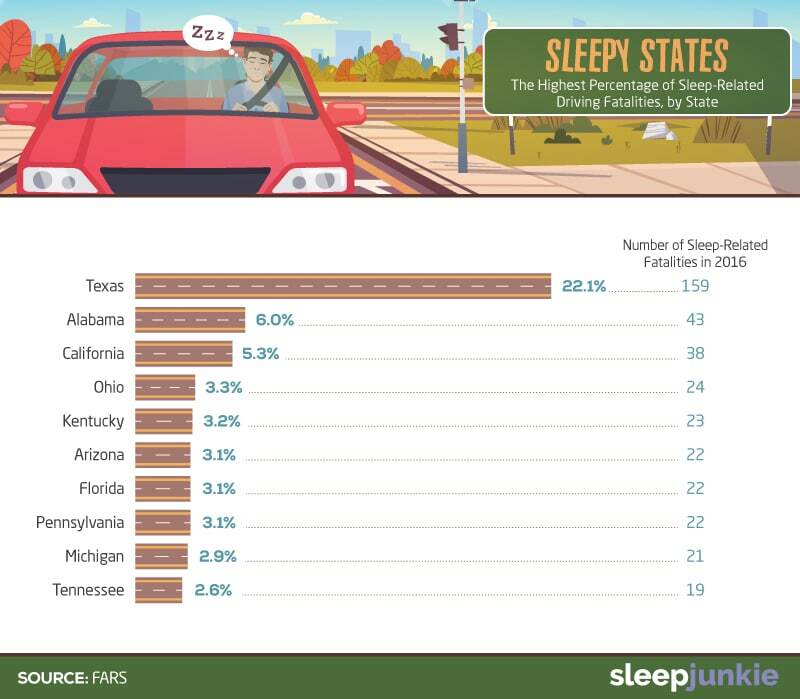 The Lone Star State accounted for more than 1 in 5 fatal accidents involving a sleepy driver – 159 in total. While Texas’ population may account, in part, for this high total, the same cannot necessarily be said of the second-ranked state, Alabama. A string of ugly incidents has led some Alabamians to call for a law that would punish drowsy drivers more harshly. The two states that have already implemented such measures, Arkansas and New Jersey, have seen only limited success in enforcing them – although it’s worth noting neither ranked among this top 10. California also saw roughly 5 percent of these sleep-deprived crashes nationwide, driving concern among state authorities. The California Highway Patrol has urged particular caution during the days following daylight saving time adjustments, which they say correlate with an uptick in deadly crashes. The remaining top-ranked states were quite scattered geographically, ranging from Arizona to Michigan. However, they possessed roughly similar records, accounting for 2.6 to 3.3 percent of fatal crashes nationally. Roughly two-thirds of fatal crashes involving sleepy drivers were collisions with inanimate objects rather than other vehicles. This implies drowsy drivers often drift from the roadway, crashing into obstacles intended for these scenarios (such as guardrails) as well as those that aren’t (such as stop signs). However, the next most common outcome was even more terrifying: front-to-front impacts with another vehicle. This could foreseeably occur if a drowsy driver swerved into oncoming traffic, resulting in a head-on collision with another car. Front-to-rear collisions represented 7.5 percent of these fatal crashes resulting from a lack of sleep. This kind of crash likely results from a driver’s failure to stop when the car ahead of them brakes. 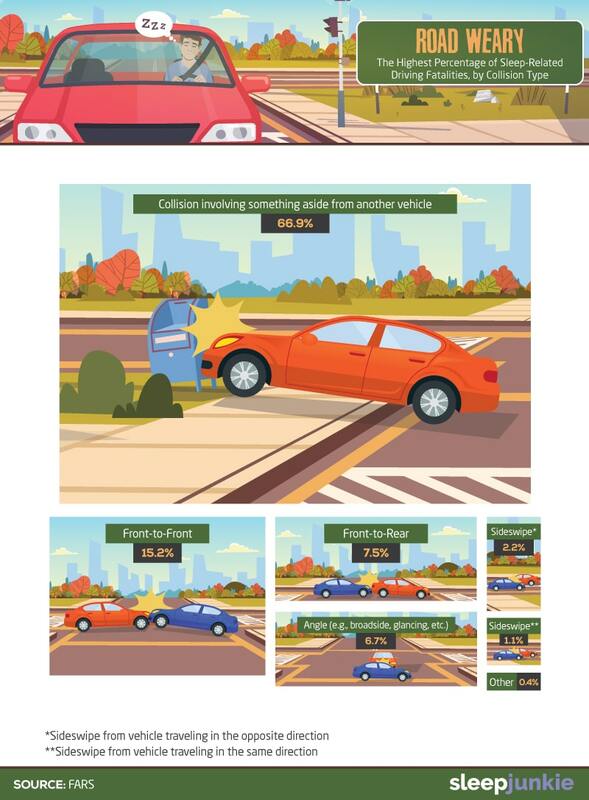 As automated driving features become more common in American vehicles, many manufacturers have developed automatic braking tools to avert precisely this kind of accident. Accordingly, the NHTSA recently established an agreement with 20 leading car brands to implement automatic braking in 99 percent of new vehicles by 2022. While fatal crashes tend to occur most often in the evening according to our data, drowsy driving takes its greatest toll in the early morning. 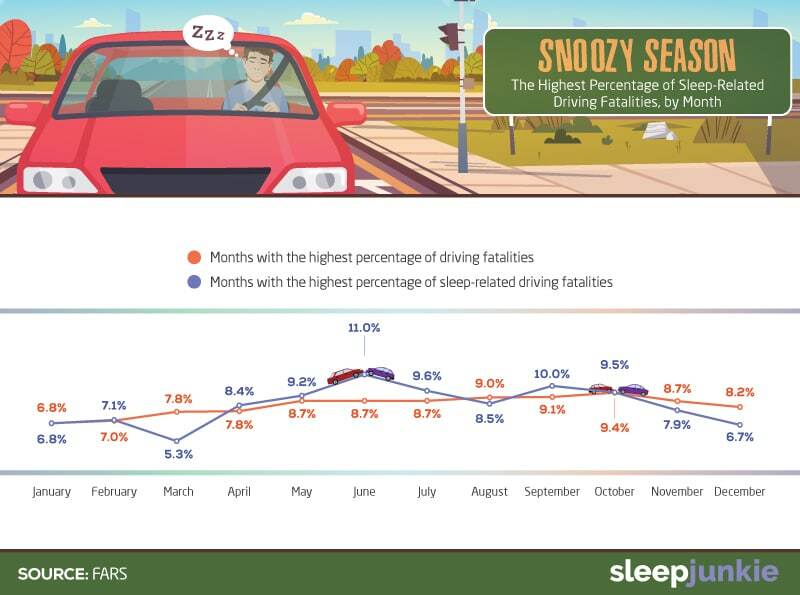 In fact, more than 9 percent of crashes involving sleep-deprived drivers occurred between 5 and 6 a.m., and 8.8 percent took place during the following hour. This timing suggests drivers either commuting to work or leaving a late-night shift – workers the CDC identifies as a high-risk population for sleep-deprived driving – are likely involved. The 3 a.m. hour also witnessed a significant portion of these fatal collisions, which might correspond to difficult times for long-haul truck drivers traveling through the night. Interestingly, the Federal Motor Carrier Safety Administration estimates 28 percent of commercial truckers suffer from sleep apnea, which might contribute to drowsy driving danger throughout the industry. One outlier to this early morning trend was the 3 to 3:59 p.m. time slot, which witnessed nearly 6 percent of these fatal accidents. While driving fatalities related to sleep deprivation were relatively consistent across the week, certain days proved slightly more dangerous. Sunday produced the largest portion of these deadly accidents – perhaps due to exhaustion from the night before. Monday also accounted for a relatively high percentage of crashes, similarly suggesting the effects of exhaustion resulting from the weekend. 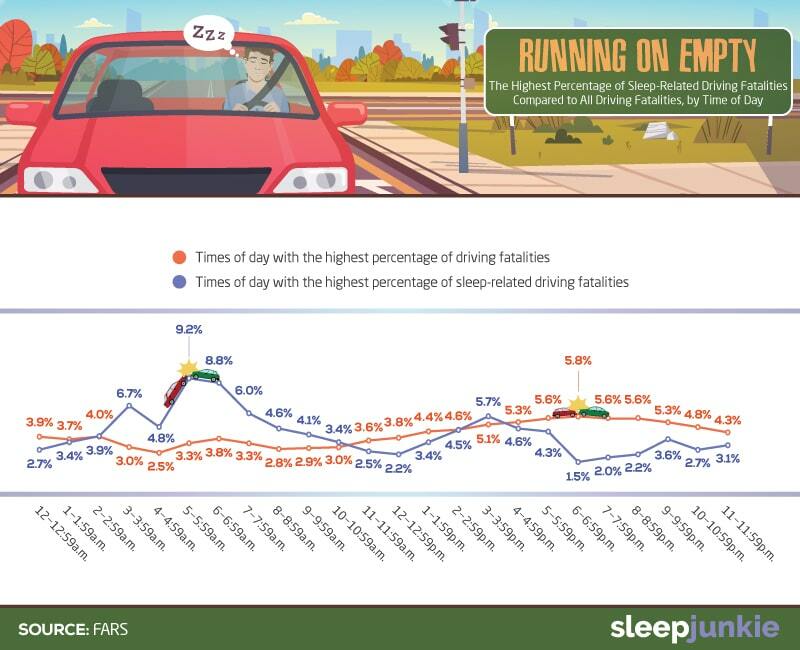 Tuesday and Wednesday saw a dip in sleep-related driving fatalities, accounting for just 12.4 and 12.1 percent of crashes respectively. Conversely, Thursday through Saturday witnessed a slight increase each day. This trend suggests that while workers with long shifts may account for much of the country’s drowsy driving damage, this danger isn’t entirely dictated by the rhythms of the workweek. Rather, it seems the weekend’s anticipation and aftermath have some influence on sleepiness at the steering wheel. Overall, fatal crashes gradually increased over the course of the year, before registering a small decline in November and December. But drowsy driving fatalities occurred in a much more varied pattern, with peaks in June and September. These findings contradict what one might assume: that drivers would be more prone to accidents in winter months with relatively less sunlight. In fact, some of the darkest months of the year, December and January, had some of the lowest crash numbers related to sleep. The month with the lowest percentage, however, was March – accounting for just 5.3 percent of fatalities all year. This observation is interesting in light of law enforcement’s concern about the effects of daylight saving time on drowsy driving because we turn our clocks forward in that month. 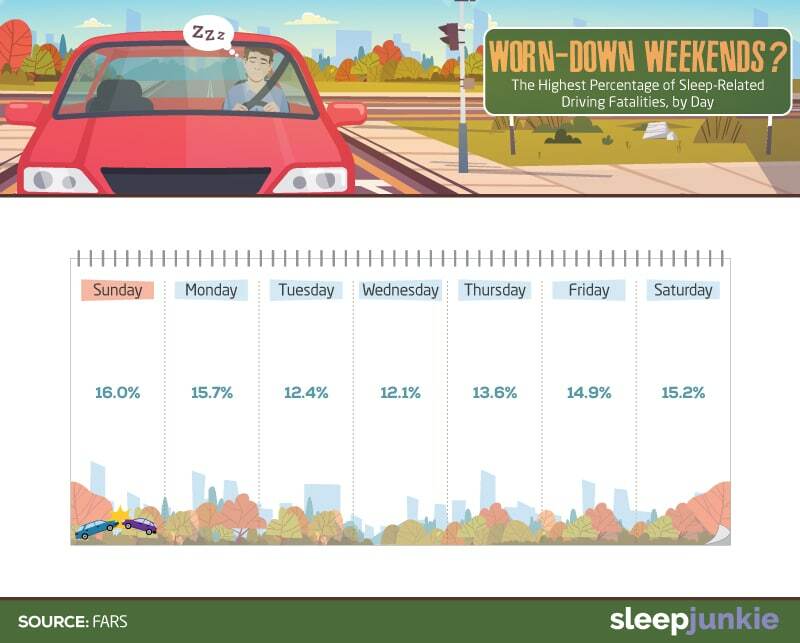 November, in which we push back by an hour, similarly featured relatively low numbers of drowsy driving crashes. While these findings present a compelling view of the drowsy driving threat, you can’t prevent other drivers from hitting the road while they’re too tired to drive. You can, however, remain vigilant about getting the sleep you need to drive safely. If you have any doubts about your ability to remain awake behind the wheel, don’t take the risk of foregoing rest. You owe it to yourselves to err on the side of caution because our findings prove how dangerous resisting sleep can be. While driving drowsy can have devastating consequences, it’s not the only risk associated with skipping rest. Poor sleep has been linked to dozens of adverse effects on people’s wellbeing, symptoms no one should accept. 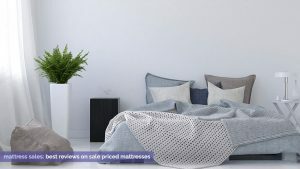 That’s why Amerisleep produces mattresses that are carefully engineered to provide restorative rest. It’s our mission to help you start sleeping better, so you can stay fresh on the road – and everywhere else. To compile this project, we utilized data from the NHTSA Fatality Analysis Reporting System. This nationwide census of fatal accidents is provided annually for public access. We analyzed data from 2016, the latest full year for which data were available. 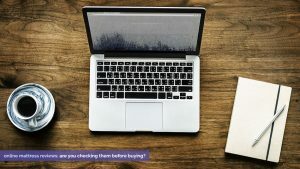 Want to share these findings and images with your own audience? You’re free to do so, as long as it’s for noncommercial purposes and you attribute Amerisleep appropriately with a link to this page. After all, giving credit where it’s due is nothing to sleep on.